The year 2009 saw the twentieth anniversary since Boundary Books was formed in Cheshire by Tony Laughton, Alan Harrison and myself. In 1989 we were all avid collectors and had been offered an opportunity to produce the first Limited Edition volume in the MCC Cricket Library Series - Sketches at Lord’s - my book on the 19th century cricket lithographs of J C Anderson, co-written with a good friend, the late Professor Derek West. Enthused by this project, we decided to make Boundary Books a vehicle for further publishing ventures and soon dipped a toe in the world of dealing in rare and collectable books and autographs. As collectors, we were dissatisfied with the available outlets for selling our duplicates and generally felt there was room for a small specialist dealer who was in sympathy with the needs of collectors and could operate on low overheads and modest margins. In particular, at that time autograph material was not being properly dealt with and we saw this as a need that should be satisfied. Since then, of course, new cricket dealers and auction houses have blossomed as our hobby has gained in popularity. Through the nineties we published a number of interesting books by authors who became good friends and supporters of Boundary Books and seemed highly satisfied with our products. These included some big names in the world of cricket - John Arlott, Bill Frindall, David Gower, Ian Botham, Graham Gooch, E W Swanton - as well as highly acclaimed researchers and writers like Gerald Brodribb, Sir Michael Marshall, Tony Laughton, David Rayvern Allen, Jack Hearne and David Frith. In 2001 we renewed our collaboration with MCC to publish the monumental Great Cricketers. The Age of Grace and Trumper by George Beldam. This was followed by another finely illustrated book in the MCC series - Felix and the Eleven of England by Gerald Brodribb. For both of these, we were indebted to the initiative and encouragement of Jim Swanton who ensured that two such worthy projects could see the light of day. In 2008 we published Tony Laughtonâ€Ÿs awardwinning book on the life and works of Albert Craig - Captain of the Crowd. I would like to think this has set the bar even higher in terms of production standards and research scholarship. Most recently, we produced the gargantuan 1100pp volume, The David Frith Archive, a fantastic record of one manâ€Ÿs life-long obsession with the game and its endless possibilities for collecting and archiving. In an unintended piece of symmetry this was our twentieth new title in twenty years. More titles are in the pipeline and these will follow the path that we have stuck to throughout these twenty years. We have shunned the fashion for producing facsimiles of old books as that is catered for elsewhere. Our niche remains original works of cricket history, produced to a high standard, in a form that is of interest to both collectors and students of the game. To complement publishing, we have offered selections of rare and second-hand cricket books, autographs and memorabilia in 38 numbered catalogues and numerous un-numbered stock lists, newsletters and e-alerts. We have tried to unearth the unusual and ephemeral rather than produce long lists of more easily obtainable books. Catalogue One was a slim little photocopied affair but it did contain an 1876 Wisden in original wrappers for £470! Soon after, we sold A D Taylorâ€Ÿs own run of the first fifteen issues of Wisden - complete with original wrappers - for £23,400, a sum that would hardly buy the 1864 volume now. Different times indeed. Other highlights in those early Catalogues were regular items from famous collections of the past - these included George Hirst, Gubby Allen (his set of personal diaries), Siegfried Sassoon, E K Brown, E G Wynyard, Charlie Barnett, Hal Cohen, H S Altham, John Arlott, Jim Coldham and G F Earle. We also acquired the complete libraries of E W Swanton and Gerald Brodribb and continue to sell items from these important sources. 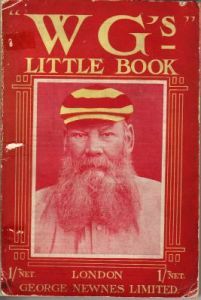 Amongst other special items we were privileged to catalogue, was a virtually complete set of Lillywhiteâ€Ÿs Guide, including the rare 1853 issue; J M Barrieâ€Ÿs Allahakbarrie Book of Broadway Cricket (1899); Sir Jeremiah Colmanâ€Ÿs The Noble Game of Cricket; Nicholas Wanostrochtâ€Ÿs Felix on the Bat and countless other rarities. In Catalogue 29 we offered a very special copy of Trowsdaleâ€Ÿs Autograph Birthday Book, signed by over 400 cricketers from the Golden Age. In 1998 we supplied a unique archive of letters relating to the Bodyline tour and Harold Larwood which formed an important contribution to the history of that troubled period in the game. In 2007 Tony Laughton and Alan Harrison both bowed out of Boundary Books to concentrate on their own collections and other projects. They very generously helped me to continue the business alone and both remain good friends and supporters of our endeavours. At the same time I re-located from Cheshire to Oxfordshire and the stock came with me, eventually to our new showrooms in Stanford in the Vale. I am now able to devote more time to Boundary Books and have welcomed the opportunity to meet far more of the customers who had previously only been voices on the end of a telephone line or names on a mailing list. While the internet and e-mails have made so many aspects of collecting cricket books easier, many of us regret the gradual passing of the old collector/dealer relationship. In my own case this was nurtured by countless trips to Ted Brownâ€Ÿs emporium in Cornwall where buying books was more about talking, discussing and drinking tea than the more frenetic ways of today. Finally, let me thank you for your highly valued custom, which for many goes back to the start of Boundary Books, and I hope that you all enjoy this special twentieth anniversary catalogue.